Safety Speed Manufacturing offers a variety of optional accessories for its vertical panel saws and panel saw/router combos that can help increase productivity, ensure accuracy and reduce the physical strain of processing parts. They can all be ordered online and shipped within two or three business days. 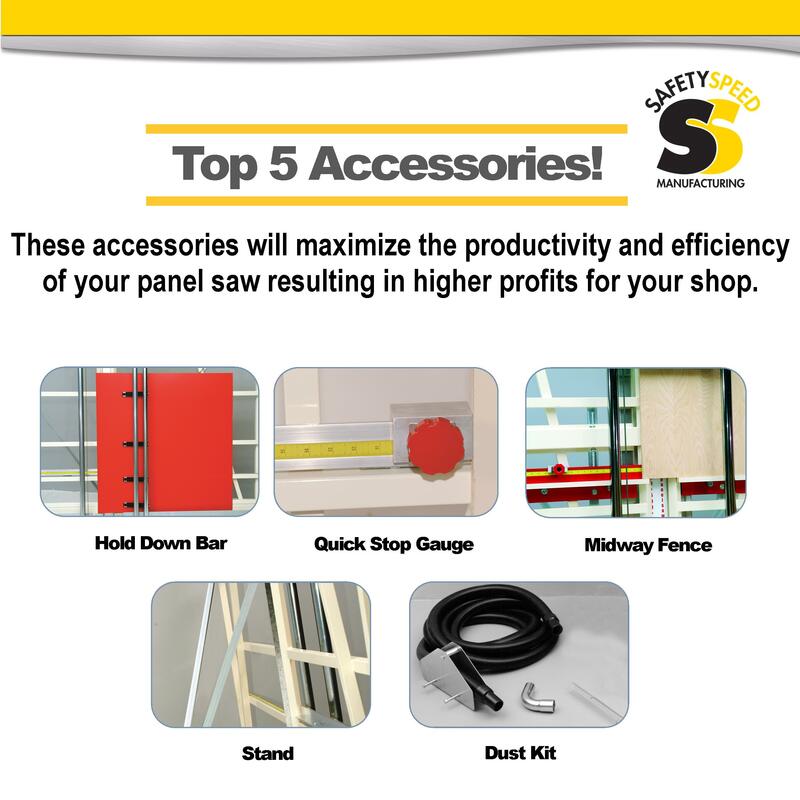 Safety Speed’s impressive accessories lineup includes the five best-selling add-ons profiled here: Dust Kit, Stand, Quick Stop Gauge, Midway Fence and Hold Down Bar. Here’s a snapshot of each of these productivity boosters presented in order of their sales popularity. Dust is the unwelcomed but inevitable by-product of sawing and routing wood-based panels, plastics and other materials. Safety Speed’s Dust Kit is a simple, yet effective engineering solution for capturing dust at the point of tool contact making for a cleaner and safer work environment. The Dust Kit connects a vertical panel saw or panel saw/router combo to an existing dust collection system or to a double-filter vacuum with a 20-gallon capacity or to a 55-gallon drum. 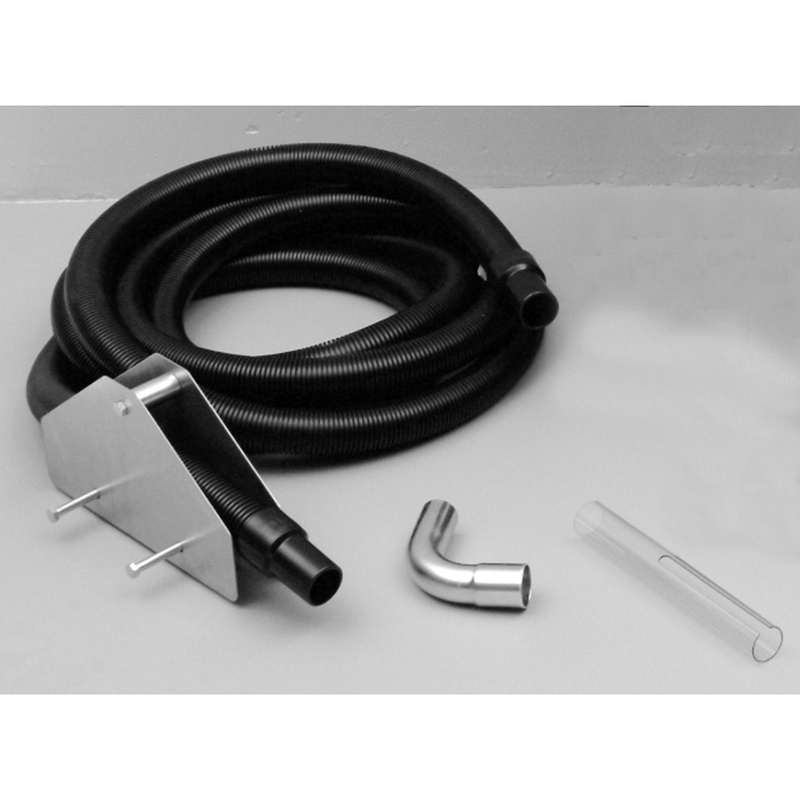 The kit includes a 10-foot flexible hose that incorporates rollers and other components to keep the hose connection clear and freely moving with the machine’s power unit. Learn more and view video. 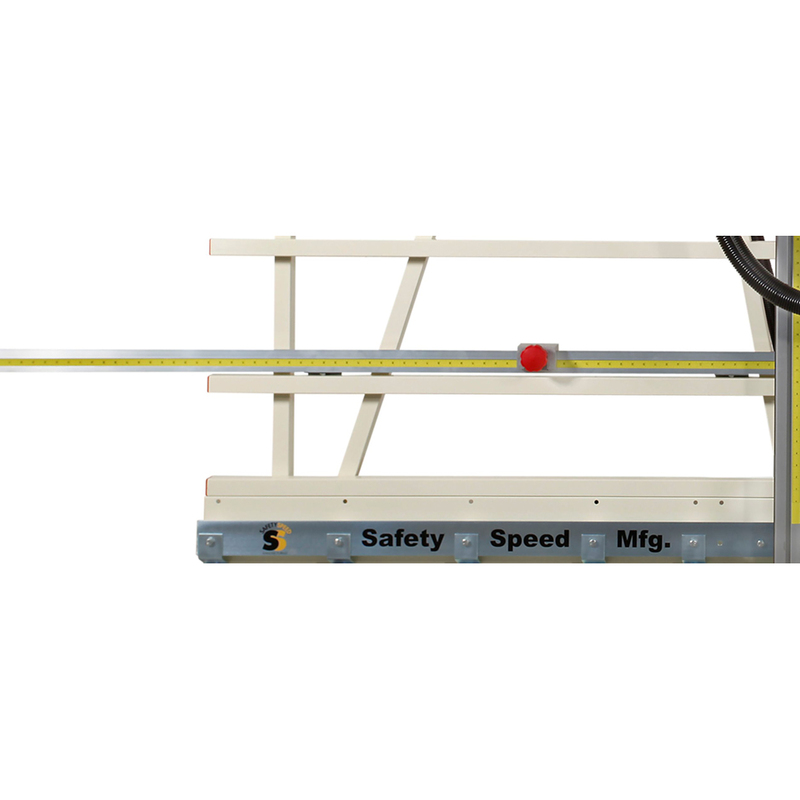 Safety Speed customers typically include the purchase of a stand and wheels when placing an order for a new vertical panel saw or panel saw/router combo. 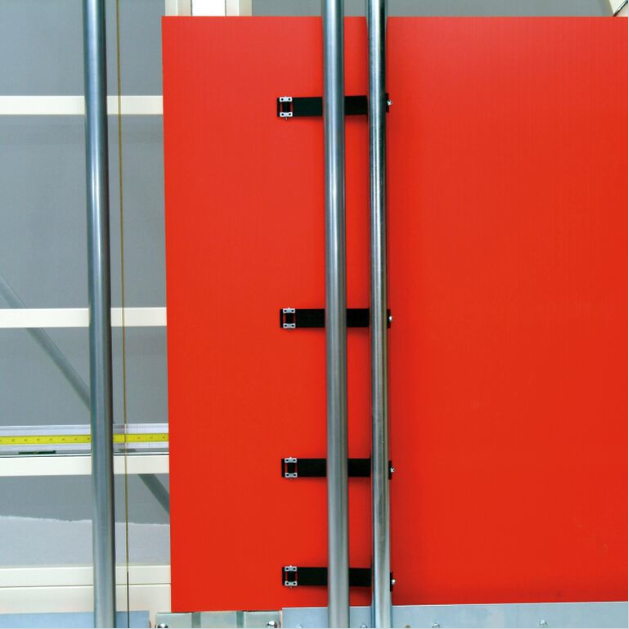 The light-weight, yet heavy-duty stands are the preferred option to propping a machine up against a wall. Outfitting the stands with a set of wheels makes it easy to move the machine around the shop. Also available are folding stands that are easy to store and transport, making them ideal for job-sites. Learn more and view video. Safety Speed’s Quick Stop Gauge saves time by facilitating quick and easy adjustment for repeating cuts of any length. The gauge consists of an 8-foot-long heavy extrusion with an embedded measurement scale and an adjustable machined aluminum stop block. Learn more and view video. The Mid-Way Fence system is the perfect add-on for just about every vertical panel saw and panel saw/router combo in Safety Speed’s line up. 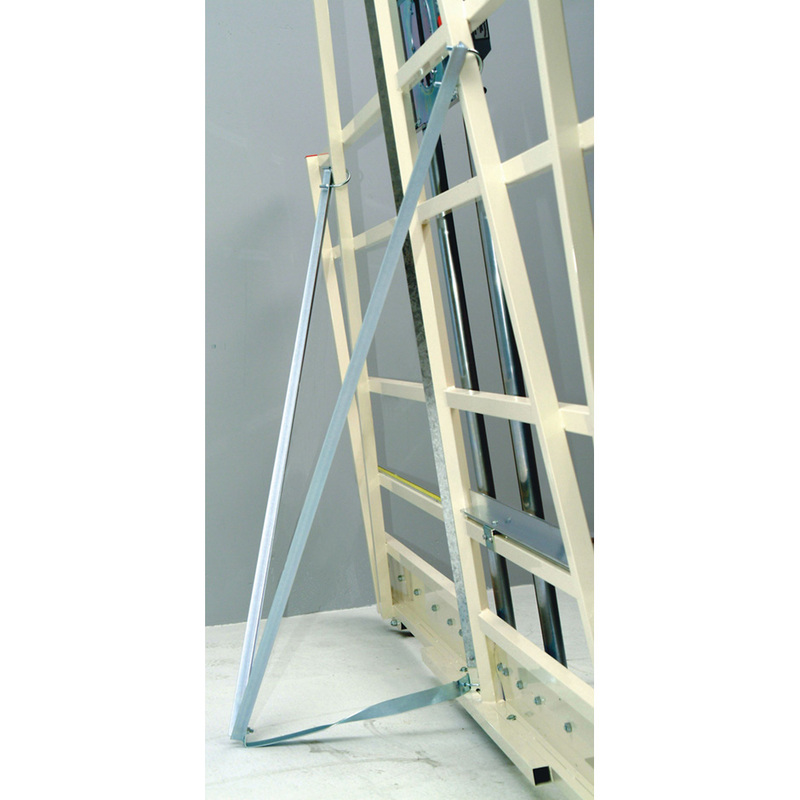 The Mid-Way Fence is a simple and affordable ergonomic solution for processing small panels. No more stooping: The fence brings the panel to waist height so the operator doesn’t have to draw the blade all the way down to the base of the saw to make a cut. 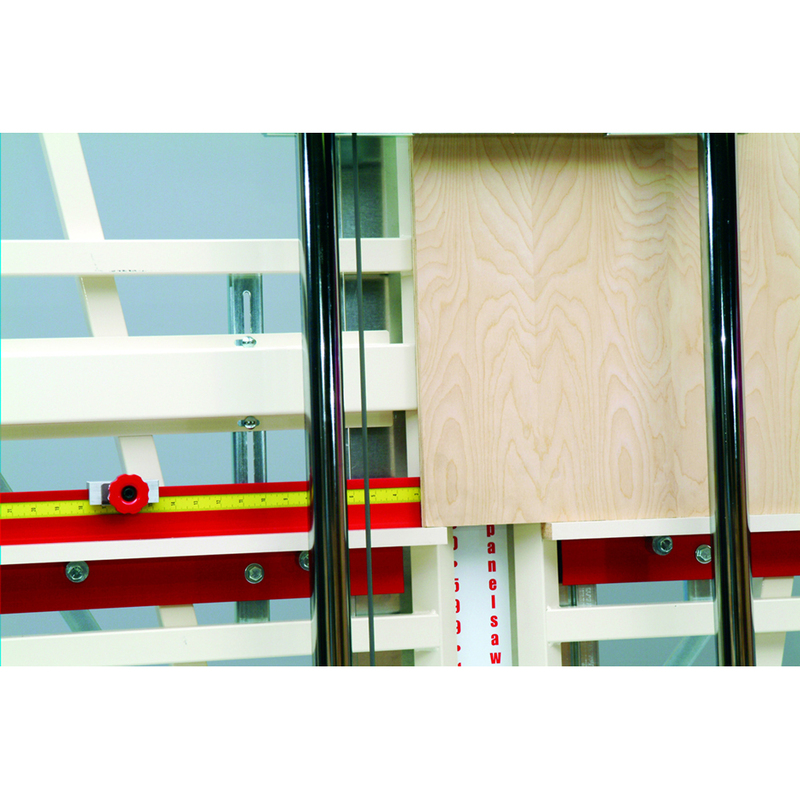 The system, which incorporates removable fence supports on both the left and right of the machine center, includes a stop block for performing repeat cuts. Learn more and view video. Safety Speed’s Hold Down Bar makes it possible to safely and accurately cut materials ¼ inch thick or thinner. The Hold Down Bar’s spring steel fingers with non-marring rollers reduce vibration and flex while cutting thin materials. Achieve chip-free cutting by using a carbide saw blade. Learn more and view video. Houska says more and more customers are purchasing one of three saw accessory discount packages that Safety Speed offers – Gold, Silver and Bronze – and in the process reaping a 20 percent savings compared to buying each of the items individually. The Gold Package is customized to maximize the benefits for cabinetry, furniture and woodworking shops. It includes a Mid-way Fence, an 8-foot Quick-Stop Gauge, a high-quality saw blade for cutting melamine, veneer and laminates, a fixed stand a set of wheels. The Silver Package is specially designed for crating and packaging shops. It includes a Dust Kit, an 8-foot Quick-Stop Gauge, a high-quality saw blade for cutting wood, a fixed stand and a set of wheels. The Bronze Package benefits building component shops. It includes a 5-foot Quick-Stop Gauge, a high-quality saw blade for general purpose use, a fixed stand and a set of wheels. Learn more about Safety Speed’s discount accessory packages.